Yay! Grunkle Stan! But I don&apos;t know much about gargoyles- so don&apos;t judge. It&apos;s a small appearance- but a big enough one to let ya know he&apos;s going to actually be in the story. "Ya know, I could really go for..."
That&apos;s all the hunter got out before the smaller of them sqeaked loudly and went limp. William almost didn&apos;t catch the cervitaur and lowered them slowly to the ground. Looking down, Will was a little disappointed. Dipper woke to the smell of food wafting in through the slightly open attic door of his room. Picking himself up from his bed, [aka clumps of blankets] he stretched -much like a cat would- all four legs giving a satisfying pop. Yawning, the cervitaur recognized the smell drifting from, what he assumed was the kitchen, was, indeed, bacon. His face scrunched up in disgust. Then his blackened nose started twitching in delight as he caught the faint smell of flowers and grass coming from the open triangle window. Dipper suddenly found himself in the backyard, with a mouth full of purple flowers he didn&apos;t even know the name of. But, he did know they were Mabel&apos;s flowers. He went to spit them out, but his jaw muscles just weren&apos;t listening to him, and the cervitaur was forced to swallow every petal. He felt every one of them- sliding down the moist insides of his throat, the muscles working and aiding the strangled flower in its descent into his starving deer stomach. 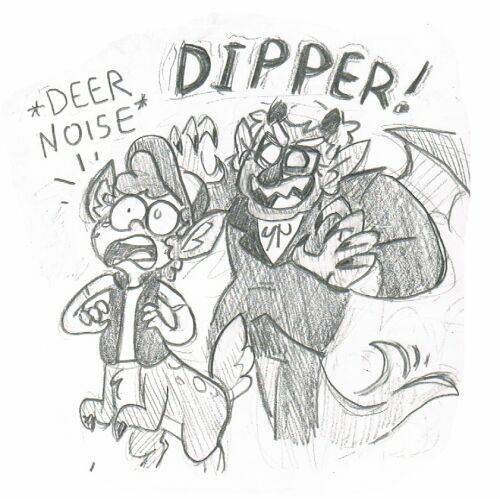 Dipper never knew he could hate something so much- but enjoy it so much at the same time. "Oh no. What&apos;s Mabel gonna think of me when she finds out that I ate her special flowers she&apos;d been growing for Pacifica?" Panicing, he quickly glanced around to make sure Mabel was no where nearby. Instead of the twin he was searching for, he saw William slowly walking towards him. "Woah, there, flap-cap! I know your half deer, but geez, isn&apos;t this going a bit too far?" The hunter said that a little too loud for the cervitaur&apos;s liking, seeing as the brunette he was looking for in the first place was now peaking out of the back kitchen window. There was a gasp, and Mabel&apos;s head dissapeared from the dirty glass window. Then she came rolling out the door. They made all the doors in the house larger so the mermaid&apos;s tank could easily fit through; they also added ramps beside both back and front deck stairs. No one really actually knew how she moved the tank, &apos;cause it moved without her even pushing or pulling something. Dipper guessed it was some sort of mermaid magic Mabel has yet to tell them about. "Dipper!! What have you done!?" She stopped next to her flowerbed, a giant empty space now clearly visible within the flowers and plants. "you knew those were for Pacifica! I was going to surprise her on our next date-!" Before he could try to apologize, Mabel grumbled a bunch of mixed words under her breath. He only caught the words "Why do you have to ruin everything..?" before she strolled away back into the house. 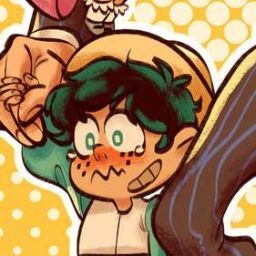 Ears flattening, he was going to turn and go take a walk through the woods to take his mind off of what had just transpired when a gentle hand cupped his cheek. Looking up, he made eye contact with his Will- wait. Did he just call him his Will? Argh. Those soft yellow eyes[?] and fluffy matching hair was getting to him. Looking directly at William suddenly brought back the memories from last night. Face going crimson, his hands shot up to try and hide the obvious blush that started from his neck and reached up to his ears. "Hey, you know it&apos;s not your fault right..?" William&apos;s soft hands slowly tugged his own, bringing them down to his sides. "They&apos;re instincts, nothing to be ashamed of, and definitely nothing to ignore." Eyes stubbornly staying downcast, the cervitaur started twiddling his thumbs, silent. 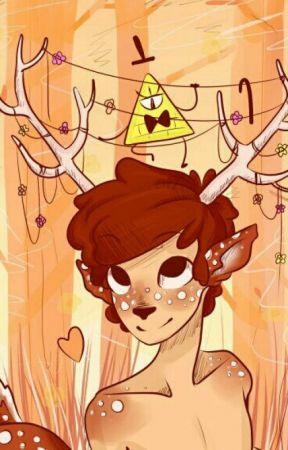 Understanding Dipper wasn&apos;t going to say anything, Will continued. "You wanna know what I think?" He used his thumb and forefinger to tilt the other&apos;s head up, forcing Dipper to make eye contact. "I think they&apos;re pretty cute~" He whispered. Dipper nearly stumbled backward as William&apos;s lips made contact with his own, [I had to!!] the hunter&apos;s arms circling around his waist to steady him. Almost melting in the hunter&apos;s arms, Dipper leaned into William&apos;s chest, his own arms finding their way around the other&apos;s neck, forcing the kiss to become deeper. Soon enough it became an all out make-out session, both tongues fighting for dominance over the other before the smaller of the two gave in, allowing Will to devour and explore every inch of his mouth. Eventually they had to part for air, never breaking eye contact as loud gasps filled the quietness of the backyard. William&apos;s lips parted to say something, but a certain gargoyle beat him to it. "You know, you guys should really get a room." Grunkle Stan was perched atop the roof, looking down at them. He was still wearing an oversized bright pink apron from when he was cooking breakfast inside. Clawed hands on his hips and stony brows raised high. Dipper&apos;s slightly swollen lips opened in an "o" as his blush grew, if that was even possible. He was guessing things wouldn&apos;t really be the same from now on. Ta da! The start of their relationship right there! I know I&apos;m gonna at least get a couple complaints about something in this chapter eventually.